There are lots of childhood favourites that we enjoyed through the 70s, 80s and 90s including many British classics. How many of these do you remember? Please note that more than one DVD option is available for each TV show in most cases, and you'll often be able to see many more options (such as box sets or individual series) when you click the links through to Amazon. Simplyeighties.comis a participant in the Amazon EU Associates Programme, an affiliate advertising programme designed to provide a means for sites to earn advertising fees by advertising and linking to amazon.co.uk. The classic children's series featuring the lovable bear originally aired on BBC between 1975 and 1979, with specials from 1980 to 1986. If you would like to relive your childhood and see every original episode of the hilarious pink cat once again, then you can do just that with this fantastic DVD collection. Hartley Hare and his friends kept many pre-school children amused and educated during the 1970s. Relive those happy times watching the ATV series with one of these DVDs. Another British childhood favourite from the 80s which followed a group of rejects from a toy factory. Featuring Geoffrey, Bungle, George and Zippy. This ITV show has become a cult classic and entertained many British kids throughout the 70s and 80s. Ah yes, remember this? I remember watching this American series on BBC1 through the summer holidays. Now available on DVD, why not enjoy watching the series once again with your own kids or grandkids? Forget Ghostbusters! Us Brits enjoyed this zany series instead. This was shown on BBC1 at around teatime and featured a range of crazy characters including Timothy Claypole, Hazel McWitch, Dobbin the pantomime horse, Miss Popov and many others - wacky entertainment indeed! Narrated by Richard Briers, this wibbly wobbly cartoon featuring Roobarb the green dog and Custard the pink cat appeared regularly on our screen during the 70s just before the evening news. The complete American sitcom starring Melissa Joan Hart as Sabrina Spellman, who suddenly found herself with magical powers on her 16th birthday. Who can forget Screech with his high-pitched voice or teen dream Kelly Kapowski? This U.S. series followed a group of high school friends and also became a firm favourite in many British households in the early 90s. Collection of feature-length adventures featuring the loveable great dane, Shaggy and the rest of the gang. Starring Lee Majors as Steve Austin. Every boy at school wanted to be the bionic man and this now iconic series can be enjoyed in its entirety on DVD, or you can purchase individual series, too. Starring Gudrun Ure as the very British superhero. This amusing series was produced by Tyne Tees and aired on Childrens ITV during the 80s. Featuring the voices of Derek Grifiths (SuperTed) and Jon Pertwee (Spotty). A classic 80s cartoon that ran for three series and was produced in Wales, but was broadcast in English, thankfully. I have only vague memories of this imaginative children's sci-fi series was first broadcast by the BBC in 1975. It was set in Britain where a strange noise emanating from all machinery and technology causes the population to destroy them. Starring Arthur English and Peter Sallis. 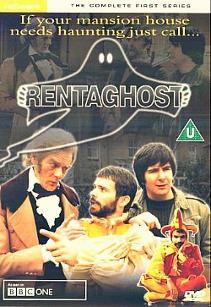 If you weren't a Rentaghost fan then this series may have floated your boat. 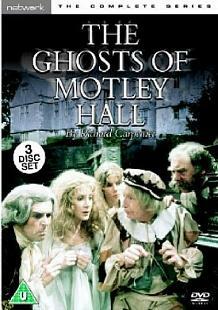 Shown on ITV, it followed the adventures of five ghosts who haunt Motley Hall. With Chris Tarrant, Sally James, Lenny Henry, Bob Carolgees and John Gorman. Saturday mornings have never been the same since the demise of this wacky entertainment show! Remind yourself of what you've been missing with a DVD. This set contains six feature-length movies and various episodes from the classic television series featuring animated slapstick fun! Featuring the voices of Willie Rushton and Nick Shipley. This cult, British claymation series followed a group of monsters living in a castle. There were just 13 episodes of this stop motion series, but can you remember the names of the firemen? They were, of course, Pugh, Pugh (who were twins), Barney McGrew, Cuthbert, Dibble, Grub. Another british classic which was voiced by the legendary Carry On star Kenneth Williams. Characters included Arthur the Caterpillar, Evil Edna the walking TV set and Mavis Cruet the clumsy fairy, to name but a few! - fantastic fun! Starring Jon Pertwee as Worzel the scarecrow who had a different head for different occasions, and Una Stubbs as Aunt Sally the fairground doll. The original series voiced by Bernard Cribbins following the adventures of strange-looking furry creatures who help the environment by collecting and recycling rubbish. Another British classic and you will surely remember the theme tune "underground, overground, wombling free, the wombles of Wimbledon Common are we..."
Starring Lynda Carter and Lyle Waggoner in the original series which was very popular back in the second half of the 70s.